Sombrero project in Peru. Photo by Auryn Resources. Auryn Resources (TSX: AUG) announced today that it has identified a significant zone of oxide copper mineralization over a 1.2-kilometer strike length and 500-meter width at the Milpoc prospect. This is about 12 kilometers south of the company’s 120,000-hectare Sombrero copper-gold property, which is located in southern Peru in the Andahuaylas-Yauri belt. According to Auryn, Sombrero is characterized by a strong structural control and significant copper and gold values from historical surface samples, with principal targets being copper-gold skarn and porphyry systems and precious metal epithermal deposits. In a press release, the miner said that the rock samples taken at the Milpoc prospect returned copper – oxide mineralization grades ranging from 0.1% – 8.45% and silver grades ranging from 0.06 g/t – 101 g/t. 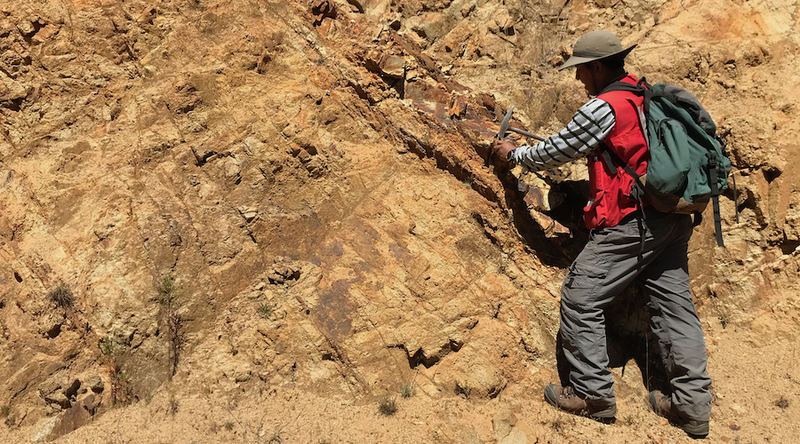 The Vancouver-based firm also explained that the stratiform mineralization identified at Milpoc is hosted within red bed sediments of the Casapalca formation and is the first mineralization observed stratigraphically above the Ferrobamba formation. According to Auryn, the Ferrobamba hosts the known high-grade copper-gold exo-skarn mineralization at the Sombrero project to the north. "The high-grade copper-oxide and silver mineralization at Milpoc represents another opportunity within the Sombrero district to discover an additional intrusive center that could be related to skarn and porphyry mineralization,” said Michael Henrichsen, Auryn’s C.O.O. and Chief Geologist, in the media brief. “Our technical group continues to discover new styles of mineralization in different formations that we feel demonstrate a very high level of mineral endowment within this newly-emerging district,” he added. In Auryn’s view, the copper-gold skarn mineralization at Sombrero has geological similarities to Glencore’s Tintaya mine and MMG’s Las Bambas mine.